The Ford Mustang is one of the most recognisable cars in the world, yet it has remained strangely elusive for British drivers with just a handful imported each year by the most determined of enthusiasts. However, 51 years after the original was launched, Ford has finally agreed to sell its iconic muscle car in right-hand drive in Britain. 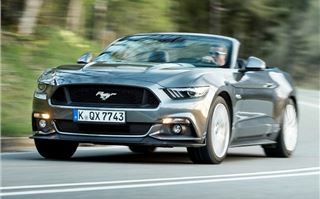 The UK-spec Mustang will be almost the same as the model sold in the USA; this means us Brits get the sixth-generation car - launched in the USA in 2014 - with the traditional V8 engine offered alongside a more efficient 2.3-litre four-cylinder EcoBoost. The design of the latest Mustang is aggressive, purposeful and - well - American. The front is particularly striking as it is shaped like a clenched fist, with ripples along the top of the huge bonnet and a sharp flat front end that turns heads, wherever it goes. The sleek and muscular lines continue to the back of the car, which is completed with trademark three-bar light clusters. 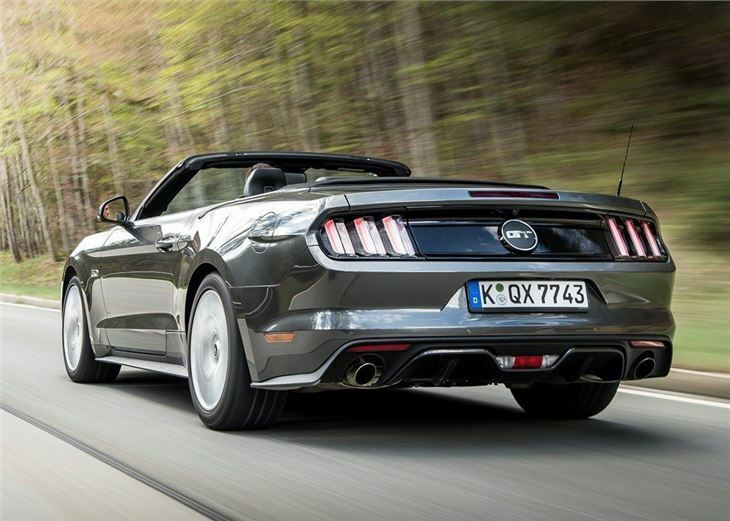 The British Mustang is offered in two bodystyles - coupe and convertible - and both get 19-inch wheels, LED taillights and xenon headlights as standard. 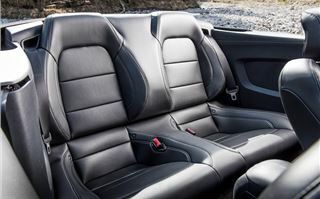 The interior has also been improved, to give it a premium feel, with brushed aluminium trims, soft touch materials and dual-zone air conditioning. 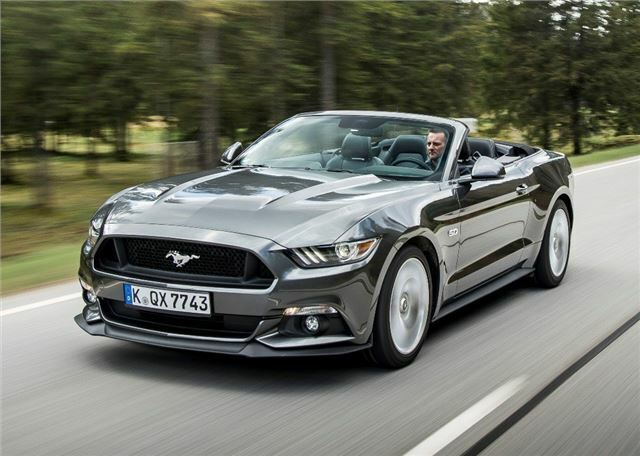 Traditionally the Mustang has always been a pleasing car to the eye, but somewhat lacking when it comes to the quality of its handling and ride. Thankfully, Ford has solved this by introducing independent rear suspension. UK models also get the optional performance pack fitted as standard, which means stiffer suspension, larger brakes and a limited-slip differential. 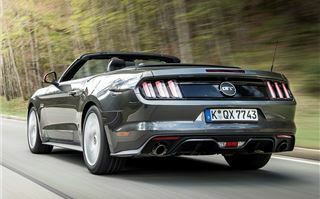 As a result, the sixth-generation Mustang is much better car to drive, compared to its predecessors. It's competent in corners coupled with the ability to absorb lumps and bumps in the road, without losing traction or trying to shove the rear end into the path of oncoming traffic. 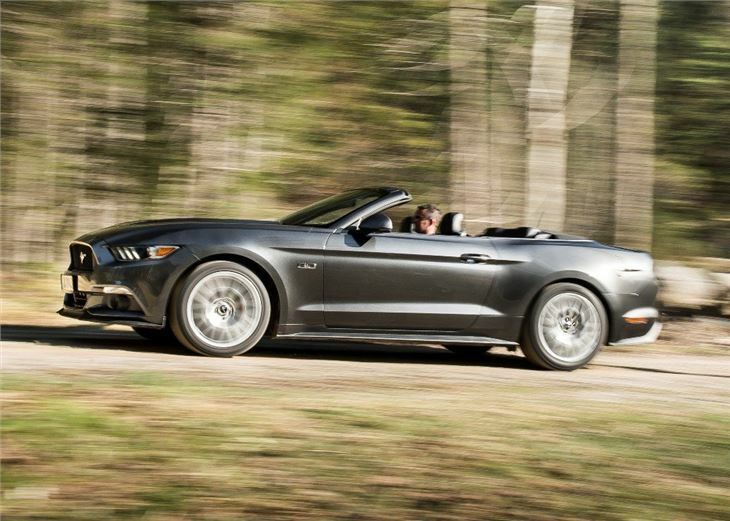 It's a monumental leap forward for the Mustang and American cars in general. 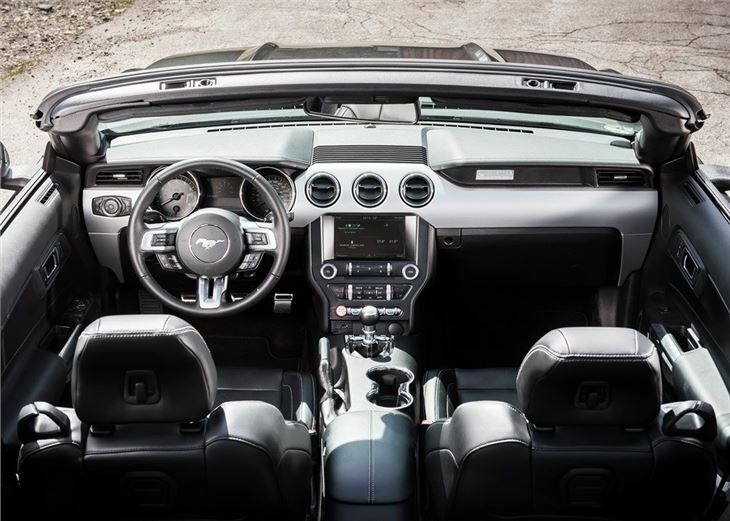 The Mustang is decent cruiser too, with a balanced ride and good levels of sound proofing, making motorway runs a comfortable and enjoyable experience. Ford has also introduced an all-new six-speed manual gearbox, which rivals some of the best in the business, with a snappy but smooth gear change. What doesn't quite fit, however, is the EcoBoost engine. 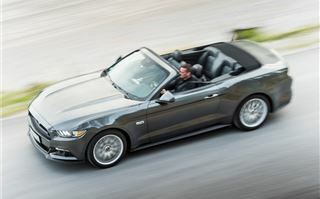 On paper the 2.3-litre engine should be the perfect partner for the modern Mustang, with 314PS and a claimed 34.5mpg. Yet, despite 434Nm of torque from 3000rpm, the EcoBoost engine feels breathless and underpowered when laden with 1620kg of American muscle car. 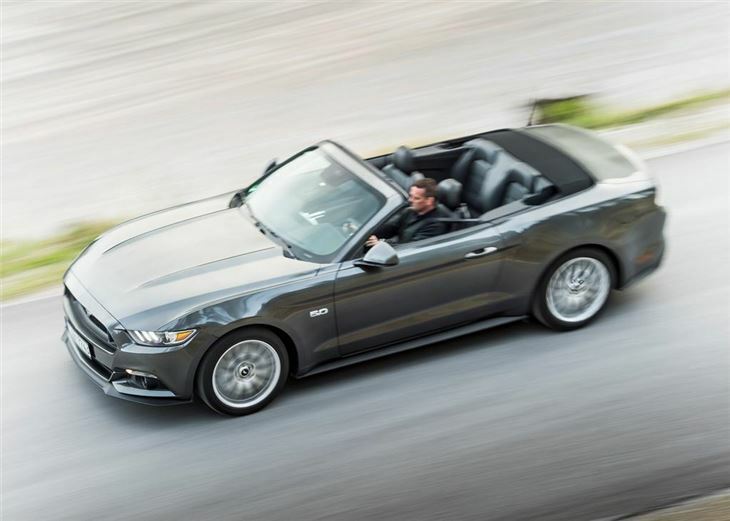 The Mustang feels brisk in the mid-range, if you work the four-cylinder engine hard, but it rarely feels as quick as the official numbers suggest. 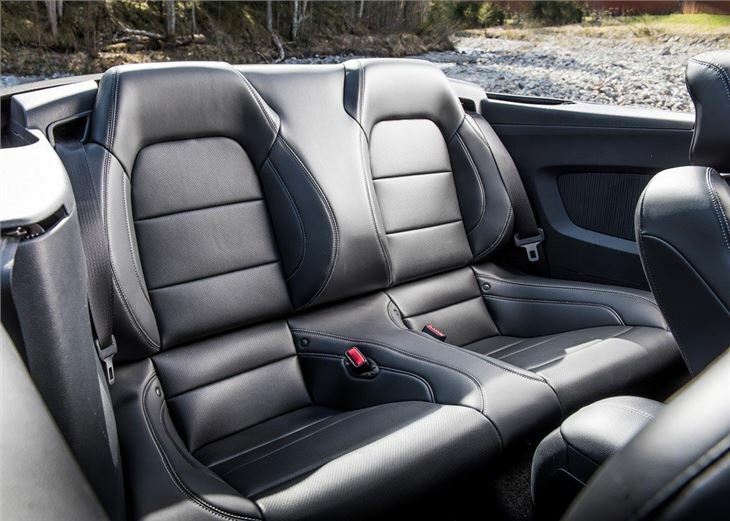 The EcoBoost's sound-simulating technology does little to improve things either, with the engine bay sounding like it is home to a swam of angry middle-aged bees. Ford would argue that the EcoBoost's economy gains will outweigh its lack of power, with the engine emitting 184g/km of CO2 and returning up to 35mpg. 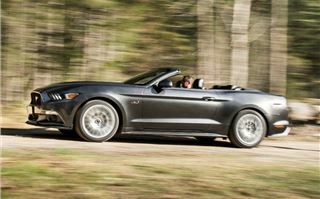 However, during our test with the Mustang convertible, we averaged less than 20mpg, which makes the EcoBoost a thirsty engine, even when compared to the 418PS V8, which returns a claimed 20.8mpg. 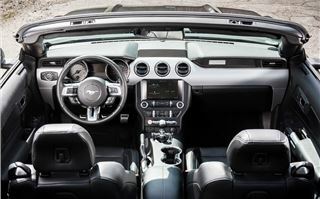 There are also issues with the Mustang's interior build quality, with too many cheap scratchy plastics and flimsy switches. The folding roof also lacks refinement, with large gaps between the folded roof and bodywork, while the rear seats are tiny and only suitable for small children. In the Mustang's defence, it is cheap. Prices start at £28,995 for the coupe and £32,995 for the convertible. Plus you get a lot of car for your money, with leather seats, an eight-inch colour touchscreen and a rearview camera all standard fit. 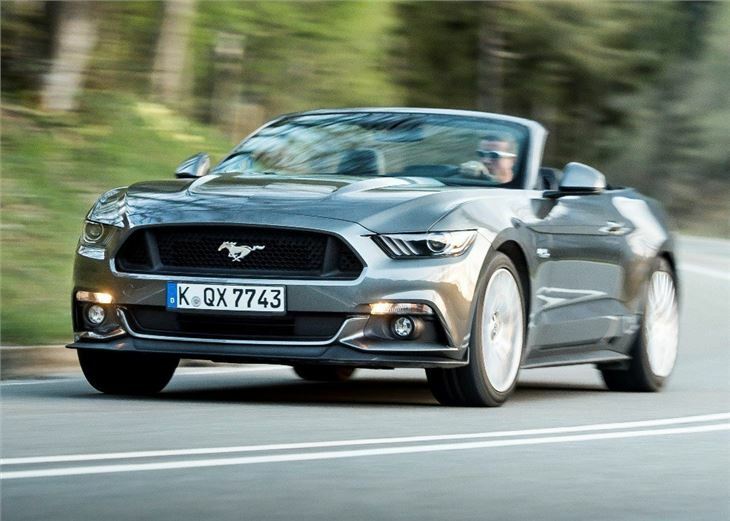 However, unless you're a Mustang diehard, we struggle to think of any reason to recommend the Ford Mustang over a diesel Audi A5 Convertible or BMW 4 Series.